Shock as ‘Star Wars: Episode 9’ Poster Leaks! The Star Wars: Episode 9 Poster has been leaked! Well, it might not be the official poster, heck it might just be a draft that was floating around, but it does give us a sneak peak at what’s in store. Rey holds a lightsaber, Chewey stands with a tilted head behind her, and behind him is a women in a fluttering cape. Below Ray is C-3PO wearing a shoulder belt and armed with a bowcaster, on the left is Finn with an fish-headed alien over his shoulder, and on the right is is Poe armed with a plaster, a purple bodysuit-wearing individual behind him and BB-8 behind her on the rightmost side. Below them we Kylo Ren below Rey holding his lightsaber. His helmet is back. Off to the right below him are the iconic storm troopers, and to his left is a cluster of what looks to be the Knights of Ren. Now at the bottom are a team of Storm Troopers, but they are blood red. Of course there are star fighters and other star wars ships in the background, but notable the title below is just the iconic Star Wars insignia. Looking at this poster, questions arise. Why is C-3PO wearing Chewey’s gear? Who is that fish-headed alien? The next Porg? Are the Porgs gone? Who is the woman in the cape? Who is this person in a purple bodysuit? The Knights of Ren? They’re here? Jannah has been on Star Wars: Episode 9 set photos before. She packs a bow. It must pack a powerful punch considering all the villains have blasters. Zorri, the person is purple, is possibly played by Keri Russell. She previously played Ellis from Dawn of the Planet of the Apes and Lindsey Farris from the J J Abrams’ Mission Impossible III. There’s not much we know about her character, but she’s cool so she gets Star Wars points. The Knights of Ren are back. We don’t have much on them besides what we know from Force Awakens, which is they are the other students Luke trained who, when given the option, went with bratty Ben Solo instead of Luke Skywalker. We don’t even have a comic on them. 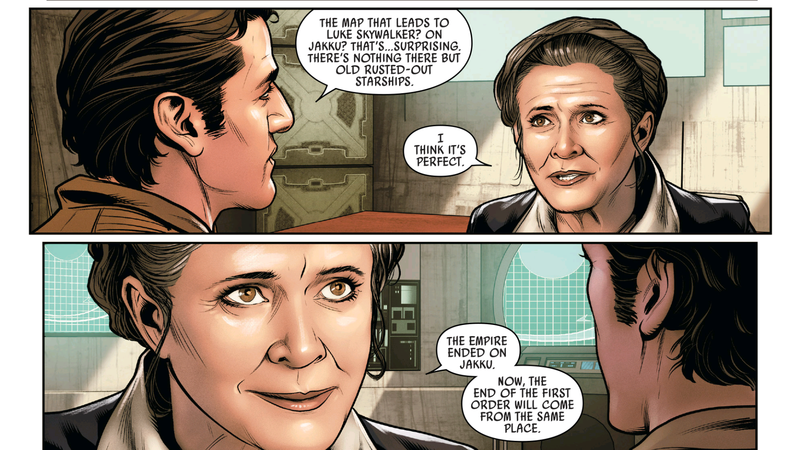 But we do have a comic called Star War Poe Dameron written by Charles Soule with art by Angel Unzueta that takes place directly after Last Jedi, bringing Poe and Rey together at last. There’s not much action, but the character banter is great. Poe brags about being the best pilot in the galaxy and how he survived so many crashes, causing Rey to ask him if he’s the best pilot in the galaxy, then why does he crash so much? While it doesn’t fill in any information on the Knights of Ren, it does bring to light how Poe survived the crash on Jakku and has more scenes with Princess Leia. Until Episode 9 comes out….